Since the 30th March 2018 Palestinians in Gaza have been protesting against the inhumane living conditions created by a decade-long Israeli imposed blockade. They have been marching towards their homes and lands from where most of them were ethnically cleansed – cleared out to make way for Israel in 1948. Under international law they have a right to return to their homeland. On the demonstrations over the past year Israeli snipers have shot and killed at least 190 people of which at least 35 were children, with a further 6000 more protesters were shot and injured with live ammunition. The injuries required over 120 limb amputations. Last Saturday they killed three more 17 year old boys. On the 28th February 2018 the UN Independent Commission of Inquiry on the 2018 Gaza protests found that, “Some of those violations may constitute war crimes or crimes against humanity” and found “reasonable grounds to believe that Israeli snipers shot at journalists, health workers, children and persons with disabilities, knowing they were clearly recognisable as such”. Israel sells arms to over 100 countries including some of the worst human rights abusers, and attributes the success of its weapons to the fact that they have been “battle-tested” on Palestinians in Gaza and the rest of Palestine. Still Palestinians march every Friday in Gaza, carrying their flags and facing the Israeli snipers and their bullets. And we will march with them. 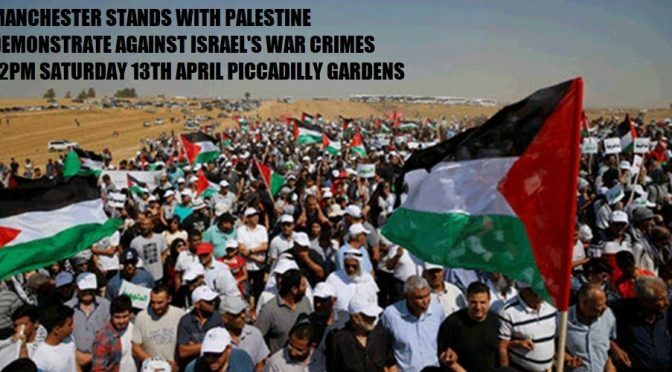 Demonstrate in solidarity with the Great Return March, and break the chains of UK complicity with Israel’s ongoing war crimes against the Palestinian people.